Discussion in 'Education & Research' started by NKVD, Sep 27, 2017. Why did Mahatama gandhi used incomplete version of shloka of bhagwat geeta ?? 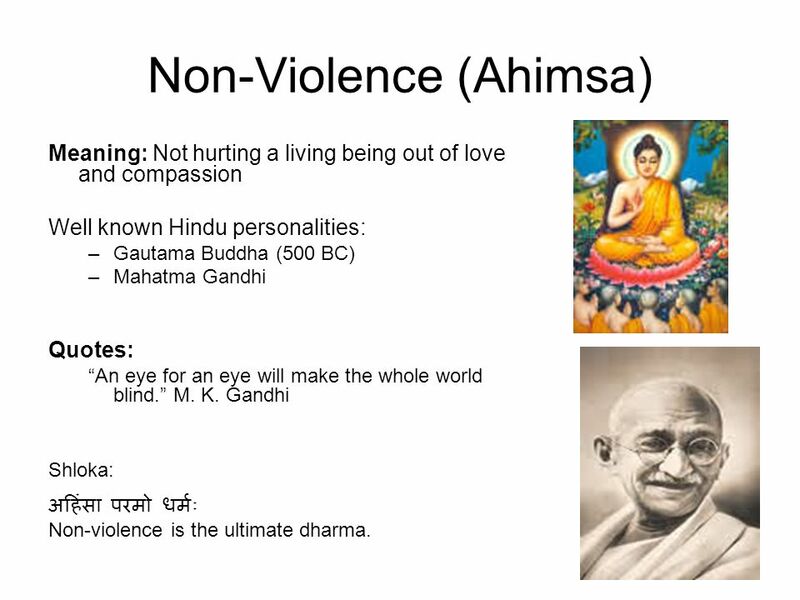 ""अहिंसा परमो धर्मः धर्म हिंसा तथैव च: l"
(Non-violence is the ultimate dharma. So too is violence in service of Dharma). kurup, Ankit Kumar 001, Angel Eyes and 5 others like this. A_poster, Angel Eyes and Levina like this. There were already two groups within Indian National Congress. Balgangadhar Tilak faction supported violence, the other one supported engaging with the British for accomplishing the needs of the people. Gandhi came in this juncture. Maybe he wanted people to do Ahimsa movement, where participation will be huge from all walks of life. Violence is something which wont involve kids, women in those days. Levina, NKVD and WhyCry like this. both of them were students of metaphysics IE common human beings knowing the existence of the mother nature in their respective lifes ( experiencing the state of being helplessness ) , gandhi and buddha were . both were incomplete in their life . soul which is enlightened never preach or for that matter teach anything as after enlightenment , a soul ceases to posses any thoughts what so ever . no discrimination of right and wrong , no good or bad , and so on . debates are welcome and i will be very blunt with my words when ridiculing the so called incomplete gurus mahatma saints ( whatever one may call them of all the so called religion ) of the world . Shri Bhagwat Geeta , they use and abuse all their life like many other scriptures said and to be listened and followed by someone in certain special circumstances . i call them novice poor humans . gandhi was the best example and so was buddha and so are all the preachers of the world . karmany evadhikaras te ma phalesu kadachana ma karma phala hetur bhur ma te sango stv akarman ! friends on the forum can also kindly try to explain the meaning of the above mentioned shlok so as to enlighten me . This shloka is from second chapter of Shreemad Bhagwat Geeta and it is about Karmayog. The Lord is explaining to Arjuna the meaning of Karmayog in this. Ankit Kumar 001, Levina and NKVD like this. karmani—prescribed duties; eva—certainly; adhikarah—right; te-of you; ma—never; phalesu—in the fruits; kadacana—at any time; ma—never; karma-phala—in the result of the work; hetuh—cause; bhuh—become; ma—never; te—of you; sangah—attachment; astu—be there; akarmani—in not doing. zebra7, Levina and NKVD like this. cos lets face it.. he is also the father of pseudo secularists. The enlightened, whitebeard, Levina and 1 other person like this. whitebeard and Levina like this. So who is d Naruto in our story who has d guts n strength to defeat india's enemies. yes sir . that was my point . lord explaining to arjun only under those circumstances , special circumstances when a human soul is about to realize the presence of god everywhere in every particle . so all the shloka's as they call said during that time was just for arjun but for humanity . knowingly or unknowingly , everyone is moving towards his or her destiny . which is explained in Santana Dharma only which never preach or teach to follow some human soul assumed to be some sort of god or superpower or for that matter enlightened one , and the moment a human being starts preaching or start describing what is right and what is wrong , that very moment the conclusions can be made , AS it is said and i know , everything happens by the will and wish of the almighty ( whoever it may be allah ram jesus or any other or none mentioned ) , of him OR her being a common human being walking the path to spiritual enlightenment ( everyone is walking though some are aware and some are not ) because defining right or wrong good or bad challenges the truth , IE : everything happens by the will and wish of the almighty ! and i understand samskript too . Angel Eyes and Levina like this. what was spoken to Arjuna was for everyone and not just for Arjuna. Moreover, please read carefully, it is about Yoga. A yoga is a combination of two or more. here it is about a soul and God also called parbrahmana. It is how you combine yourself with your lord. And in that the path of renunciation and path of Karma are equal with more emphasis on Karma. sure , it was about karma and only karma but results , when someone define anything , as gandhi and buddha in question here or for that matter any other self proclaimed god man or god preaches anything to anyone to be followed by anyone in any life or circumstance , that very moment , he proves himself to be incomplete IE : just another guy satisfying his or her ego of being or knowing something more than the person he accompanies that moment . the enlightened ones never make opinions and justify or for that matter unjustify any action or karma to be performed , as good and bad are perceptions formed by novice soul's as all the karma's will get neutralized at the end of the life cycle of a soul . sir , i guess you forgot the title of the post about manipulation of shloka of shri bhagwat geeta . all i wanted to say was that both gandhi and buddha were just common human beings till they justified and unjustified any karma . they have got nothing to do enlightenment .